Attractor brings together sensational Indonesian music duo, Senyawa and two of Australia’s leading dance companies, Dancenorth and Lucy Guerin Inc to create a unique music/dance ritual. Senyawa’s performance reinterprets the Javanese tradition of entering trance through dance and music as a powerful secular present-day form. Their sound borrows from the metal bands they listened to as teenagers – Black Sabbath, Metallica, Iron Maiden – and Indonesian ritual and folk idioms. Their music and performance is influenced by forces in nature to take the audience into a transformative state outside of organised belief systems. As the performance unfolds, Senyawa’s unique fusion of hand-made electrified stringed instruments with opera style and heavy metal voice slowly builds to a euphoric pitch. The exceptional dancers are propelled into wild physical abandonment and ecstatic release, that transmits to the audience as a visceral empathic experience. The demarcation between dancer and non-dancer, audience and performer and the professional and the amateur dissolves as the performance transitions into a large-scale dance event. Premiered in February 2017, this project has been assisted by the Australian Government's Major Festivals Initiative in association with the Confederation of Australian International Arts Festivals Inc., Arts Centre Melbourne, Brisbane Festival and WOMADelaide. This work has been performed at Asia TOPA XO State, Arts Centre Melbourne (February 2017), WOMADelaide (March 2017), Brisbane Festival (September 2017), Perth Festival (February 2018) and Brighton Festival (May 2018). Performed along a beautiful stretch of the Townsville Strand, Tectonic unites sculpture, movement and sound in a dazzling site specific performance presented as part of the 2017 Strand Ephemera. Dancenorth joins forces with the Urab Dancers from Poruma Island, Torres Strait for the creation of this bold new collaboration. With the Coral Sea and Magnetic Island as the backdrop, and featuring 180 fit balls buried in the sand; Tectonic is unlike any dance show you have seen before. Micro-trampolines ignite the performance and the dancers as they run, bounce, flip, soar and ricochet across the stage. The fitballs remain buried for the duration of the festival, providing a large-scale interactive installation for the public. Performances will be held each evening throughout the Strand Ephemera Festival, on the sand next to the Strand Rock Pool and Arcadian Surf Life Saving Club. Workshops will also be held during the day within the Dancenorth installation space, offering the community opportunities to engage with the artwork. Tectonic provides a fertile platform for the sharing of culture, custom and tradition through story, song and dance. Rainbow Vomit is an immersive contemporary dance show created for young audiences, whilst maintaining appeal for kids of all ages. Audience members are invited to watch the performance through their own pair of ‘fireworks glasses’. These magical glasses are made using holographic diffraction film, which refracts light into all colours of the spectrum, generating a myriad of rainbows. This work has been performed in Townsville in April 2016; at Brisbane Festival, in September 2016; Townsville, Cairns, Mount Isa and Poruma Island in 2017; with a national tour planned for 2018. Premiered in September 2015, Spectra draws together a melting pot of visionary arts from Australia and Japan in an artistic collaboration that spans continents and cultures. 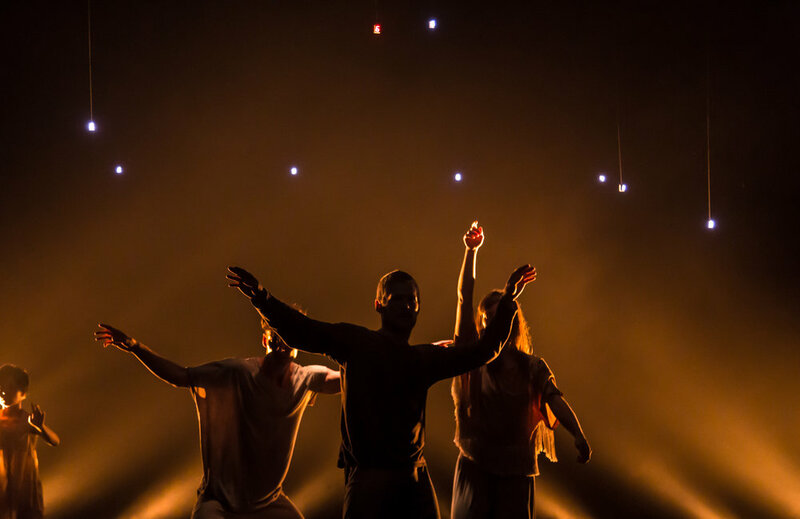 Blending contemporary dance, butoh, live music and visual art, Spectra explores the phenomenology of dependent origination which states that the secret of the universe lies in the nature of causality – the way one thing leads to another. It examines how all things that come into being – whether it be a human life, a thought or a galaxy – depend on an endless chain of preceding causes and conditions. Co-commissioned by OzAsia Festival, Spectra is produced and performed by Dancenorth and Twine Projects and features guest performers from Batik dance company in Tokyo, the visual design of internationally renowned artist Tatsuo Miyajima and live music by Jiro Matsumoto. Directed by Kyle Page and Amber Haines, Spectra is an investigation into the latent beauty that resides within causal agency, illuminating the potency of intentional actions and their inherent power to bear fruit in the future. This work has been performed at Dancenorth, Townsville, September 2015; OzAsia Festival in Adelaide, Australia, September 2015; Kanagawa Arts Centre, Yokohama, Japan October 2016; and at Sydney Festival, Australia in January 2017. Kyle Page and Amber Haines rigorously explore ‘the duet’ in Syncing Feeling. Delving into Theory of Mind, Metacognition and Mirror Neurons, Syncing Feeling Illuminates cognitive processes that facilitate a host of enigmatic aspects of the human mind, including empathy, imitation learning and the decoding of another person’s actions, feelings and emotions. Groundbreaking research within the field of neuroscience is challenging preconceptions around human interactions and only now beginning to prove what Eastern philosophy has known for millennia… the only thing that separates us is our skin. This work premiered in May 2015.